A short account of the repression that fell on old members of the Makhnovist movement in 1937-38. The years 1937-38 were a terrible period in the Soviet Union. Stalin turned on his perceived enemies within the Communist Party, murdering those organised around the Trotskyist Opposition as well as many other Old Bolsheviks like Bukharin, Kamenev and Zinoviev. In the process the surviving members of the anarchist and Makhnovist movement did not escape these massacres. Practically all those Makhnovists who had not been murdered during 1918-1922 were arrested and shot. One of the first Makhnovists to be arrested was the close associate of Nestor Makhno, Ivan Lepetchenko, shot by the NKVD in Mariupol on October 20th 1920. His brother Pavel, also an anarchist communist, appears to have perished at the same time. The Zadov brothers, Lev and Daniilo (see libcom biography of Lev Zadov) were shot in September 1938 and Viktor Belash (see libcom biography) perished in the same year. Among other Makhnovists who were shot was Grigory Seregin (1884 - 1938) who had been born into a peasant family in Kaluga province and who had worked as a fitter in Gulyai Polye. He had been an anarchist-communist since 1906. From 1917 he had been a member of a factory committee and was active within the metalworkers union. From the second half of 1917 until April 1918 he was chairman of the Gulyai Polye industrial communes, chairman of the food council, and a member of the parish zemstvo. At the beginning of 1918, he was chairman of the food section of the Makhnovist forces. He was a member of the Makhnovist movement from August 1918 and served as secretary of the 2nd Gulyai Polye District Congress (12-18.02.1919). In March 1919 he was appointed Assistant Chief of Supply of Makhno's brigade. At the All-Army Congress on Sept. 1, 1919 he was elected a member of staff of the Makhnovists, becoming an inspector and later head of food supplies which he held until the summer of 1921). On August 28, 1921, together with a detachment of Makhno he crossed over to Romania. In 1924, he took advantage of the amnesty offered by the Soviet regime and returned to the Ukraine. By 1930, he was working as a fitter in Aleksandrovsk. He was executed in 1938.
and Nikifor Timofeyevich Sprinky (Sirenek). All those arrested in the case were charged "that they are involved in the Gulyai Polye military Makhnovist Regiment, whose aims are armed struggle and revolt against the Soviet Power, and that as members of the military Makhnovist counterrevolutionary insurgent regiment, they carried out counter-revolutionary activities among the population aimed at disrupting the activities of the Party and the Soviet authorities, proving unprofitable collective farm system, accusing the Soviet power and the Party in every possible counter-revolutionary way and slandering their leaders and are actively preparing to commit acts of sabotage in the vulnerable state and collective farm sectors, and are prepared to commit terrorist acts against the assets of Communists and Komsomol (Communist Youth) members in the village,” under Articles 54-11, 54-10, 19, 54-8, 54-7 of Soviet law. In addition Skomsky was charged with that "until the day of his arrest he was an agent of the Romanian intelligence." For these crimes the NKVD troika of the Dnipropetrovs’k region sentenced all the accused to death on 1st April 1938. Sentence was carried out in Dnepropetrovs’k on 23rd April (28 persons), April 25th (9 persons), May 9th (2 persons) and July 7th (1 person) 1938. Later on all these victims were rehabilitated in 1959. On similar charges two leading Makhnovists Ivan Chuchko and Nazar Zuychenko were executed by the NKVD at Dnipropetrovs’k (see separate libcom biographies) on April 26th and July 7th 1938 respectively. Also indicted on similar charges by the Dnipropetrovs’k NKVD and indeed as leaders of the “regiment” were Vasili Mikhailovich Sharovsky and Vlas Korneyevich Sharovsky. Vasili was born in 24th December 1891 at Gulyai Polye. He was the son of the soldier Mikhail Lukyanov Sharovsky and his wife Maria Radionova, both Orthodox. He served in the Russian Army during World War One in a senior post. He was sympathetic to the Socialist Revolutionaries, though never becoming a party member, later gravitating towards anarchist communism. In 1917 he was head of the artillery battery of the Black Guard in Gulyai Polye. From January to June 1919 he was chief of the artillery of the 3rd Zadneprovsky Brigade of the Makhnovists. From September to December 1919 he was Assistant Chief of Artillery of the Makhnovists, serving as chief of artillery. Vlas was also born in Gulyai Polye in 1896. He was adjutant of the Makhnovist artillery and known for his bravery. Despite various references to the Sharovskys being brothers, including the testimony to the NKVD by Belash, this was not the case as can be seen from their patronymics. Belash says that Vlas worked in a factory in the Dniproropetrovs’k region in 1930 established an underground Makhnovist network. He was later joined in this by Vasili. The latter seems to have been fairly well educated, working as a teacher in the Kiev region, and applying to become a candidate member of the Communist Party, whilst carrying out underground Makhnovist activities! He also became a member of the Gulyai Polye village council, a school trustee. Vasili and Vlas were probably related to three other Sharovskys, all brothers, mentioned as Gulyai Polye anarchists in Makhno’s memoirs, Piotr, Grigori and Prokop. Another notable Makhnovist, Konstantin Chuprina, was also indicted on these charges and executed. Also executed in 1938 was Ignat Fedorovich Bobrakov ( born 1893). He was an anarchist sympathiser and worker who joined the Makhnovist movement in August 1918. In autumn and winter 1919 he was chief of artillery supply to the Makhnovists. With the return of the Bolsheviks to the Ukraine in January 1920 he left the movement. In the 1930s he worked as director of the October Revolution factory in Odessa. He was arrested in late 1937 and shot in the following year. In the nearby Zaporozhye region at the khutor (farmstead) of Zelyoniy Gai, 22 other ex-Makhnovists were arrested by the NKVD. Seven of these, including another Makhnovist artillery man, the deputy commander of Makhnovist artillery, Dimitriy Ivanovich Sipliviy, were sentenced to death and shot. Sipliviy came from the middle peasants in the Grigorevka Pologovsky area. 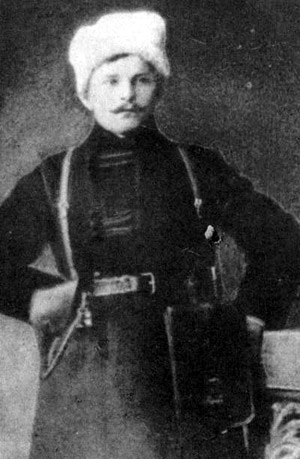 From 1919 he was a member of the Gulyai Polye anarchist group and was assistant chief of the Makhnovist artillery. Dubovik, A.V (2009). After Makhno. Kate Sharpley Library. Do you know if the full number of Nabat-journal issues exists? Nabat. Kistovki anarchistskich organizacij „Nabat“ v Char'kove, Guljaj-Pole, Odesse i Sibiri. Char'kov etc. 1917-1920. Mounted and bound by the New York Public Library, 1944. Cheers for the upload nick. Not sure if the question is formulated properly. Nabat was a confederation of anarchist groups of various tendencies and various locations. The confederation had a chain of "Nabat" newspapers, which printed some of the same material but also local content. Given that these newspapers were printed on low-quality, "grey" paper, it seems doubtful that anything like a complete set survives. The Nabat confederation had a checkered relationship with the the Makhnovist movement, ignoring it for a while but then having to beg the Makhnovists for money and take shelter in their territory. For a time there was a Gulai-Polye Nabat newspaper, which of course had to print a lot of information about the Makhnovists. This was of considerable advantage to the latter, for it allowed their propaganda to penetrate to other parts of Ukraine ("Nabat" newspapers were published in some form even in Denikenist territory). The Makhnovists had their own official newspaper, "The Road to Freedom", edited by Arshinov. Fifty issues are known to have been published but I don't think more than about half have survived. I think that's the same NY institution that bounded the journal 'Under the banner of marxism', also in 1944. It's probably complete. But who is oldskool enough to know how to copy/scan from a 'microform' or microfilm? But who is oldskool enough to know how to copy/scan from a 'microform' or microfilm? You only need to have the microfilm reader connected to a computer that has something like Adobe Pro on it; most unis have this. I'm going to look up Nabat on my school's intra-library loan network and see if I can find anything. I have always LOVED the Makhnovshchina. Steadfast and immortal! I will read through this list of names with a glass raised to them all. Thank you, my friend, for posting this. Popular with whom? Iakovlev's text was first published in 1921, before the dust had settled and is hardly a scholarly text. Iakovlev was an Old Bolshevik who concerned himself with smearing anarchist movements. The level of his analysis is indicated by his coining the term "anarcho-denikenists" to describe the Makhnovists. Regarding Nabat, a rather complete set of minutes of its April 1919 conference, held in Elizavetgrad, has been published. This is probably the most valuable Nabat document available. How can we reach to that? Iakovlev was an Old Bolshevik who concerned himself with smearing anarchist movements. The level of his analysis is indicated by his coining the term "anarcho-denikenists" to describe the Makhnovists. So being born in 1896 still makes you an Old Bolshevik? In what text did he coin the term 'anarcho-denikenist', and also, is it online? Not to split hairs here, Noa, but isn't an Old Bolshevik someone who joined the Party before 1917? Iakovlev joined in 1913 (or claims he did) which would admittedly make him a rather young Old Bolshevik. At the time he was writing about the Makhnovists he was a member of the Soviet government of Ukraine. In his essay "The Treason of 'Batko' Makhno and the 'Iron Broom' of L. D. Trotsky", http://www.makhno.ru/st/106.php], V. A. Savchenko writes: " Ia. A. Iakovlev maintained that Makhno was Deniken's 'assistant' [pomoshchnik], and that the Makhnovists were a collection of 'robbers, thieves, all of them anarcho-denikenists'." Savchenko cites a text by Iakovlev "Soviet Power in Ukraine and the Makhnovshchina" (Kharkov, 1920), possibly an earlier version of the work referred to above. This 1920 text is not accessible to me and doesn't seem to be available online. It seems Iakovlev didn't invent the term "anarcho-denikenists" because it was used in Pravda (November 6 1919) to describe the "Anarchists of the Underground", responsible for the September 25 explosion at the Moscow Communist Party headquarters. The First Congress of the Confederation of Anarchist Organizations of Ukraine "Nabat" was held in Yelizavetgrad on April 2-7 1919. The proceedings have been published in the collection "Anarchists. Documents and materials. 1917-1935." (Moscow: Rosspen, 1999), pp. 332-351. "...Our movement, despite the most unfavourable material conditions, and despite the uncertain position of our organizations and a long sequence of persecutions at the hands of the "Soviet authorities", has grown, become stronger, and aroused the interest of the broad toiling masses so successfully, that its subsequent sucess in the matter of enlightening these masses about the true path of social construction is virtually assured. "Ours is the first attempt in the history of anarchism to created a unified, organized anarchist movement, in other words to advance the ideological work of anarchists in a systematic way, demonstrating the timeliness and viability of anarchist organization." The Congress does not seem to have dealt with the Makhnovist movement in any way, even in passing. Yeah, thanks, great to be able to put faces to the stories. Do you have any more biographical info about those two, like dates of birth/death? Little is known about them, other than that they were genuine participants in the Makhnovist movement. The photos were supplied by descendants and were published for the first time only within the last few days on the Facebook page of Гуляйпільські старожитності [Gulyai-Pole Antiquities]. An account of the workers uprising in Novocherkassk, USSR, which lasted from June 1-3 and ended in a massacre and mass arrests. Critical comments on the Algerian national liberation movement by Algerian anarchist Sail Mohamed in 1951.